Madrid, the capital of Spain, is a thriving city and at the forefront of fashion and entertainment. It is a serious global city player. If you are planning a trip to Madrid, read our 14 things to do in Madrid for free guide for some cool ideas on what to do and see to ensure your stay here goes smoothly. For the budget conscious traveller we take a look at free things to do in Madrid. Walk through Retiro Park, take a stroll through the shopping district of Gran Vía, and chill out in the Plaza Mayor and get free entry into world class museums and art galleries. Madrid’s Parque del Buen Retiro, or just Parque Retiro as it is known to the locals, is Madrid’s best loved parks and top attractions. Retiro Park is the perfect place to enjoy summer days that Madrid is famous for. There are many beautiful sculptures, buildings and monuments as well as a boating lake. There are free outdoor concerts in Retiro Park during the summer. Madrid is a European centre of art and culture. It is home to some of the world’s top museums, housing world famous works of art. The two most famous museums in Madrid are the Reina Sofia and the Prado. The Prado is free admission from Tuesday to Saturday from 6pm to 8pm, and Sunday from 5pm to 8pm. The Reina Sofia Museum is free fromt Monday to Friday from 7pm to 9pm, Saturday from 2.30pm to 9pm and Sunday from 10am to 2.30pm. 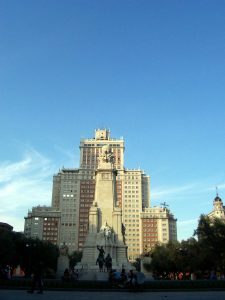 Madrid is full of beautiful squares or plazas as they are known locally. The focal point of Madrid is the main square called Plaza Mayor. The Plaza Mayor is steeped in history and has seen public executions, royal ceremonies, bullfights, Inquisition trials and many other historical events. Today it is surrounded by three-storey buildings, many excellent cafes, snack bars and restaurants with terraces. The Royal Palace, or Palacio Real is Madrid’s Royal Palace. It isthe largest palace in Europe with over 2,800 rooms. It is still the official residence of the Royal family but it is now only used for state ceremonies. The palace is open to the public. Go for a stroll through its grounds and courtyard. It’s free so why not?. The Royal Palace is a beautiful building to look at and once you have taken in this architectural splendour, check out the southern view over scenic Casa de Campo. Yes there’s a tropical jungle garden inside this railway station. It’s one of the most talked about attractions in Madrid. The tropical jungle garden is in the old atrium of Atocha Railway Station. Take a walk through this small botanical paradise while waiting to catch your train. As well as being home to many tropical plants and fauna, there is also an attractive turtle pool complete with hard-shelled residents. Plaza de España is home to a beautiful fountain and a breath-taking monument to Cervantes, The famous Spanish author of “Don Quixote”. 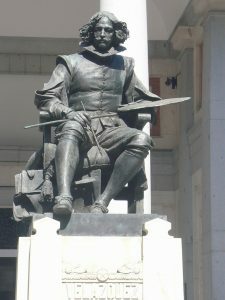 The fictional character of Don Quixote and his side-kick Sancho Panza also feature in this dominant statue. Plaza de España is very popular on sunny days for sunbathers and it’s also where you will find many street vendors. Visit Madrid’s Gran Via and take a walk down the city’s most famous street. Gran Via has featured in everything from operas to films and is steeped in history. Gran Via is one of Madrid’s busiest streets. It is lined with hundreds of shops and restaurants. It is also architecturally beautiful to look at with many buildings on Gran Via classed as landmarks. This Egyptian temple once stood in the village of Debod but today resides in Madrid in the Parque del Oeste. This piece of Egyptian heritage came to Spain when a dam was being developed in Egypt and many historic pieces were at risk of being ruined. Spanish engineers helped the Egyptian government move these monuments and in return, Egypt donated the Templo de Debod to Spain as a thank you. It’s a popular attraction today and lies in one of Madrid’s popular parks.. If you are spending a Sunday in Madrid make sure you pay a visit to ‘El Rastro’, Madrid’s largest open air market. This popular market is visited by locals and tourists alike every week. You can pick up all kinds of bargains from antiques to clothes. With over 3,500 stalls a visit to ‘El Rastro’ is highly recommended. Even if you’re just browsing, the area and the atmosphere is well worth the trip. Madrid was once a walled city. Today you can see the remains of the walls that once protected a 9th century Moorish settlement. This free attraction is behind the Cathedral. Originally the walls encircled about 4 hectares. Some parts of the more modern sections of the walls date from the 12th and 13th century. They were declared a national monument in 1954. Take a free stroll for a great walk through a Madrid’s history. Puerta in Spanish means doorway or gate. The Puerta del Sol was once the location of Madrid’s city gates. It’s also Madrid’s centre and contains a stone slab marking ‘Kilometre Zero’ which is the official starting point for Spain’s 6 National Roads. Puerta del Sol is home to Madrid’s state symbol, El Oso y El Madroño. There’s also a statue of King Carlos III and two fountains where people gather to sit around. 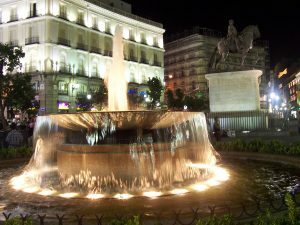 In the evenings Puerta del Sol comes to life with people going through the square as well as stopping off in one of the cafes or restaurants in the area. It’s a great place to watch the city go by. If you are interested in the history of bullfighting, then take advantage of the free admission to Madrid’s Museo Taurino (Bullfighting Museum). The museum tells Spain’s bullfighting history and houses costumes of famous matadors. There’s even a painting by Goya depicting a bull fighting scene. Photographs and relics tell the story of Spain’s controversial tradition from its origins to the present day. This museum makes optimal use of unused spaces. This outdoor museum is located underneath a road bypass. It is free and it’s well worth a visit even if it is just to see how this space is beautifully utilised. The museum’s collection is mainly made up of abstract sculptures with works by Joan Miró, Eduardo Chillida and others.